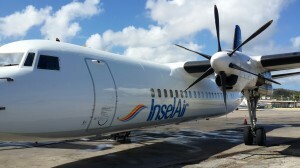 WILLEMSTAD - The local aviation company InselAir is still in deep trouble. It has canceled all ABC flights yesterday. The cause is electrical problems with their Fokker 50. Passengers were stranded for hours at the airports of Aruba, Bonaire and Curaçao. The problems have not been resolved, which means that flights will also be canceled today. Only the Sint Maarten route will be operated. On that route, the airline flies a leased aircraft from Venezuela.